Those who have the bellies to flaunt, you might as well and there’s no better way than by wearing a belly bar. You can choose various designs of belly bar, plain, colourful, soft, edgy, it all depends on your personality and mood. There are some fantastic new products just in, so if you are looking for a belly bar be sure to check them all out. All of the belly bar range are made with high quality materials and the latest cutting edge designs. 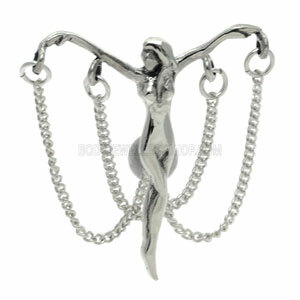 This beautifully made Dancer Reverse Silver Belly Bar is a great way to catch people’s eye. Featuring a well carved dancing figure with her hands raised, delicate chains drape from her arms making a fluid artistic piece of jewellery. Made from surgical steel, the dancer is made from sterling silver which compliments the steel perfectly. You can buy this in 8mm or 10mm, enjoying what fits and looks best on you. This entry was posted in Adult Body Jewellery, Belly (Navel) Piercings, Navel Bananabells, Surgical Steel Body Jewellery and tagged Belly Bars, Belly Jewellery, Belly Piercing Bar, Reverse Belly Jewellery on September 25, 2010 by Piercing Guru. Crystal belly bars are a great way to show off your belly button piercing and at BJS we have a great selection. Personally I love crystal belly bars because they are pure bling – totally bright and sparkly! They can be shown off with a top that shows your piercing, worn with a bikini or just kept as your glam little secret under clothing. There are a few different types of crystal belly bars but my advice is to always buy them from a body jewellery store whose quality you trust. That way you can be sure that the crystals won’t fall out and the belly bar will continue to look awesome. 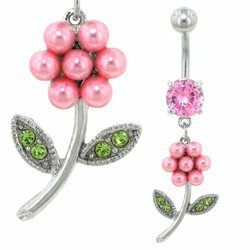 As the name suggests, crystal disc belly bars have a flat disc rather than a ball. This makes them very comfortable to wear, without sacrificing a glamorous design. These are three of my favourite crystal belly bars and they all feature gorgeous sparkling crystals. They really sparkle in the light and will really light up your look. 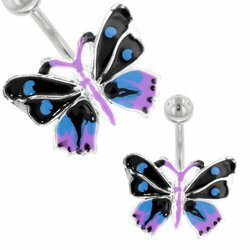 These disc belly bars are comfortable to wear under clothing, especially if you are worried about your crystal belly bar getting caught on something. This entry was posted in Belly (Navel) Piercings, Navel Bananabells, Surgical Steel Body Jewellery and tagged belly, Belly (Navel) Piercings, Belly Bananabells, Belly Bar, Belly Bars, Belly Button Bar, Belly Button Bars, Belly Button Jewellery, Belly Jewellery, Belly Piercing Bar, Belly Piercing Bars, Belly Piercing Jewels, Belly Ring, Navel and Belly Button Jewellery on July 20, 2010 by Piercing Guru.